The standard VortecTM 6.0L V8 builds power at a low rpm for a flatter torque curve. It reaches peak horsepower (360) at only 5400 rpm, and peak torque (380) at 4200 rpm. Available Bi-fuel versions of the truck seamlessly switch between gasoline and compressed natural gas (CNG). Trailer Sway Control detects when your trailer is swaying and applies the truck’s brakes, as well as the trailer’s brakes using the available Trailer Brake Controller, to help bring it back in line. Silverado HD with the available Duramax® diesel engine and Allison® transmission is cut out for the most demanding jobs and comes with a 5 year/100,000 mile warranty. See how it works. 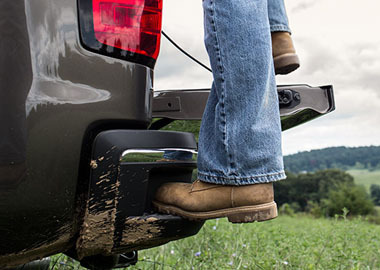 Fully boxed frame rails made of high-strength steel and nine cross-members for lateral support help Silverado 2500HD achieve a maximum payload rating of 3,534 lbs. Sometimes a step can make all the difference. Prop yourself up with the built-in CornerStep rear bumper, an ingenious feature no other competitor offers. 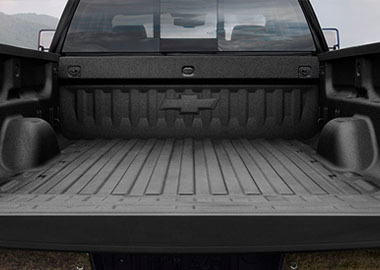 The available factory-installed spray-in bedliner adds a permanently bonded layer to your cargo box. Thick, water-sealed and finished with the Chevy Bowtie, it’s an effective way to prevent damage to the backbone of your truck. Centrally located controls put important functions at your fingertips, while large knobs and buttons are conveniently designed to accommodate gloved hands. Silverado HD is quiet, thanks in part to sound-deadening materials and inlaid, triple-sealed doors, while dual firmness foam seats provide added comfort and support. Silverado is the first full-size pickup to offer built-in 4G LTE Wi-Fi® connectivity. The truck also offers support for Apple CarPlay™, which provides an easier way to use your compatible iPhone with the available Chevrolet MyLink display. Staying connected means nothing if you can’t stay charged. That’s why Silverado HD offers multiple USB ports, four auxiliary power outlets and an available 110-volt outlet – not to mention wireless charging capabilities. Available Chevrolet MyLink keeps you connected through an available 8-inch diagonal color touch-screen, and syncs with your smartphone so you can make voice-activated calls and other commands. Silverado HD takes safety as seriously as you do with available active safety technologies – including Forward Collision Alert, Lane Departure Warning and the Safety Alert Driver Seat – that help prevent collisions before they happen.